Actinovate AG Is labeled for Agricultural purposes. 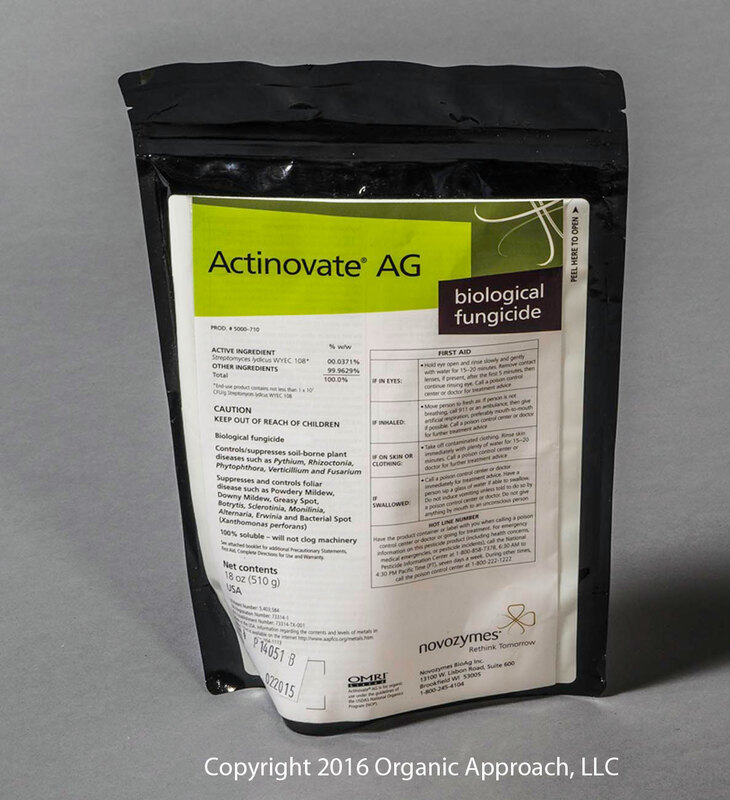 Actinovate AG is a high concentration of a patented beneficial bacterium on a 100% water soluble powder. When applied as a spray this powerful new product is extremely effective against a wide range of foliar diseases including Powdery and Downey Mildew, Botrytis, Alternaria and other aerial borne pathogens. Actinovate AG is also labeled as a soil drench application for root decay diseases such as Pythium, Phytophthora, Fusarium, Rhizoctonia, Verticillium, Phymatotrichum omnivorum (cotton root rot) and other root decay fungi. In fact, when used as a preventative, researchers have seen Actinovate AG work as well or better than most chemicals. The benefits of Actinovate AG don't stop there: Because of the special properties of the Actinovate microbe, plants treated with Actinovate AG will be vigorous, have increased vitality and have much better root growth. Actinovate AG contains the patented microorganism Streptomyces lydicus strain WYEC 108. When introduced into the plant this microbe colonizes and grows around the...root system (as a drench) and foliage (as a spray). At this point the microbe forms a synergetic relationship, feeding off of the plant's exudes while secreting beneficial and anti-fungal byproducts. This combination of the colonization and the protective secretions forms a defensive barrier around the plant which in turn suppresses/controls disease causing pathogens. The Actinovate microbe also has been shown to prey on certain fungi, disrupting their cell walls and disabling them in the process. This symbiotic relationship between plant and microbe is the optimum balance for a natural, productive growing environment. Actinovate AG makes it happen.